For other stadiums known as Corbett Field, see Corbett Field. Hi Corbett Field is a baseball stadium located in Tucson, Arizona. The stadium holds approximately 9,500 people. 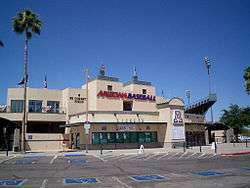 It was the spring training home of the Colorado Rockies, and is currently home to the Arizona Wildcats baseball team. First teams played at the field in 1937. Hi Corbett Field was originally called Randolph Municipal Baseball Park. In 1951, it was renamed in honor of Hiram Stevens Corbett (1886–1967), a former Arizona state senator who was instrumental in bringing spring training to Tucson, specifically by convincing Bill Veeck to bring the Cleveland Indians to Tucson in 1947. Veeck owned a ranch in Tucson at the time, and he and players sometimes rode Veeck's horses after the games. Veeck claimed that he moved the team's training camp from Florida to Arizona in order to avoid Florida's Jim Crow laws. Hi Corbett was remodeled in 1972 and renovated in 1992, 1997, 1999, and 2012. It is part of a larger city park complex, Gene C. Reid Park (which also includes the Reid Park Zoo) and Randolph Park, located between Broadway Boulevard and 22nd Street in midtown Tucson. The main playing field's dimensions are as follows: 349 feet in Right Field, 366 feet in Left Field, and 410 feet at its deepest in Center Field. The ballpark currently has a capacity of 9,500, including 598 box seats, 8,350 reserved seats, and 562 bleacher seats. There are also two ancillary fields for use in spring training, but these make no provision for spectators. For many years, Emil Bossard, groundskeeper for the Cleveland Indians, was in charge of Hi Corbett Field, during Spring Training. In 1959, he was considered the top groundskeeper in Major League Baseball and was inducted into the Major League Baseball Groundskeeper Hall of Fame in 2012. According to historian David Leighton, of the Arizona Daily Star newspaper, Emil Bossard Field and the street Bossard Place both located at Reid Park, are named in his honor. Hi Corbett served as the spring training home of the Cleveland Indians from 1945 through 1992. Cleveland announced in 1990 that they would depart Tucson and the city tried to attract the Baltimore Orioles to move to Arizona. Parts of the 1989 movie Major League were filmed at Hi Corbett Field. This production used members of the University of Arizona baseball team as extras. From 1993 to 2010, Hi Corbett was the pre-season home of the expansion Colorado Rockies, who moved into Hi Corbett with their inaugural spring training. Hi Corbett is also closely associated with minor league baseball. Aside from the Lizards, the Tucson Cowboys (Class C; Arizona–Texas League) played at Hi Corbett intermittently from the late 1930s until 1958. The original Tucson Toros (Class AAA; Pacific Coast League) played there from their inception in 1969 until 1997 (see below for new Toros team). The largest Tucson Toros crowd at Hi Corbett was 12,863 on May 17, 1981 against Salt Lake City. In 1997, the Toros essentially exchanged ownership and franchises with the nearby Phoenix Firebirds, so that the ex-Toros played in Scottsdale Stadium as the Firebirds, and the ex-Firebirds played at Hi Corbett as the Toros. In 1998 the Phoenix team relocated to Fresno, California and was renamed the Fresno Grizzlies, and the Tucson Toros became the Tucson Sidewinders, and played in the new Tucson Electric Park, which was renamed in January 2011 to Kino Veterans Memorial Stadium. The Arizona Fall League, a short season league for major league prospects, fielded a team at Hi Corbett in 1993 and 1994, known as the Tucson Javelinas. The team relocated to Peoria, Arizona in 1995 (becoming the Peoria Javelinas) to limit travel distances to the Phoenix, Arizona metropolitan area. USA Baseball was headquartered at Hi Corbett from 1997 to 2003. From 2004 to 2007 Hi Corbett was home to the Arizona Heat women's professional softball team. In addition to the large number of visiting teams that have appeared there as part of regular league play, Hi Corbett has hosted exhibition games featuring the Colorado Silver Bullets, Houston Astros and University of Arizona, among others. Baseball Hall of Fame members who played at Hi Corbett include Mickey Mantle, Willie Mays, Ted Williams and many others. On May 21, 2009, the Tucson Toros returned to Hi Corbett Field after an 11-year absence, playing as an Independent Professional Baseball League team of the Golden Baseball League. Hi Corbett Field was the home stadium of the Toros until they were evicted by the city of Tucson in 2011 before they could join the North American League. In 2012, the ballpark became the new home of the University of Arizona Wildcats baseball team. Through the first three-game series of the season against North Dakota State, the attendance at the stadium was a total of 8,870, which was nearly ¼ of the total home attendance for the Wildcats' previous season at Sancet Stadium. The park hosted both an NCAA Regional and Super Regional, as Arizona won both to advance to the 2012 College World Series. The relocation of the Wildcat baseball program to Hi Corbett has been noted as a major factor in the team's successful 2012 season, and their fourth national championship. In 2007, the Rockies asked for a package of improvements to Hi Corbett potentially totaling $10–20 million under the threat of a possible move to Goodyear, Arizona. In response, Pima County chartered a regional sports and tourism authority, funded by tourism and other taxes. Such authority was approved both by the Arizona Legislature and voters of the county. The departure of the Chicago White Sox from Kino Veterans Memorial Stadium, has forced team management to expedite plans for a future move, as the Rockies have stated that they need two other teams in order for Tucson to be a viable spring training town for them. The Rockies decided to move to the new Salt River Fields at Talking Stick in 2011 on tribal land owned by the Salt River Pima-Maricopa Indian Community near Scottsdale. The Arizona Diamondbacks share that facility. In an effort to have its baseball program compete in the best possible facilities, in August 2011, the University of Arizona signed an agreement with the city of Tucson for Arizona baseball to play its home games at Hi Corbett for the 2012 season, and will play there for at least the next five years. The UA has made several upgrades to the facility, where the Wildcats previously played selected games in the 1960s and '70s. Hi Corbett is located about three miles southeast of the UA campus. In 2013, the Wildcats ranked 21st among Division I baseball programs in attendance, averaging 2,733 per home game. 1 2 "Hi Corbett Field (Baseball)". University of Arizona Official Athletics Site. University of Arizona. Retrieved 2012-06-03. 1 2 Levesque, John (2005-03-21). "Field of memories, if not field of dreams". Seattle Post-Intelligencer. Retrieved 2007-01-09. ↑ Bill Veeck with Ed Linn (1989). Veeck as in Wreck. Fireside Sports Classics. pp. 177–178. ISBN 0-671-67540-0. ↑ "Arizona Baseball 2012 Media Guide" (PDF). University of Arizona. 2012. p. 47. Retrieved 3 June 2012. ↑ "Tucson Trying to Attract Orioles". Los Angeles Times. 1990-12-13. Retrieved 2009-06-09. ↑ "Team History". Tucson Sidewinders web site. Minor League Baseball. 2006. Retrieved 2007-04-09. ↑ Trotto, Sarah (January 19, 2011). "Supervisors OK deal for Tucson Padres". Arizona Daily Star. ↑ "Arizona Advances to First CWS Since '04". ColumbiaTribune.com. Associated Press. 10 June 2012. Archived from the original on 2012-06-12. Retrieved 12 June 2012. ↑ "University of Arizona Baseball: Making the College World Series...and Money". Forbes. 13 June 2012. Retrieved 16 June 2012. ↑ Meltzer, Erica (2008-03-05). "Pima County moves closer to forming sports authority". Arizona Daily Star. Retrieved 2008-03-10. ↑ Cutler, Tami (June 11, 2013). "2013 Division I Baseball Attendance – Final Report". Sportswriters.net. NCBWA. Archived from the original (PDF) on July 20, 2013. Retrieved July 20, 2013. Tucson Toros 1997 Media Guide (Tucson: Tucson Toros Baseball Club, 1997). Spring Training 2006: Colorado Rockies. Colorado Rockies 2007 Spring Training, Spring Training Online.